You can easily export your expense data with our CSV or PDF export options. Log in to your account from your desktop browser and make sure you're on the team's Expense List tab. At the top of the screen you will see our Search and Filtering bar. Take a look at our support article on our Filter feature. This is a powerful tool that you can use to slice and dice your data in many different ways. Once you pull up the expenses you would like to export, you will see the 'export' option in a few different places. 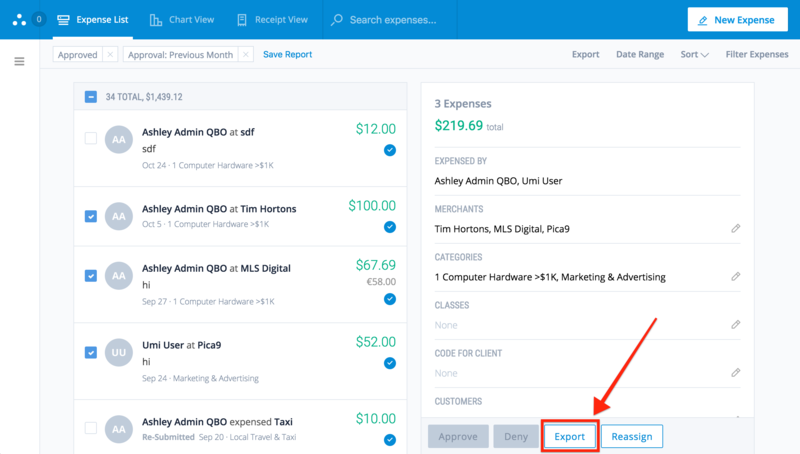 To export a specific set of expenses you can add filters and then export that filtered list. Learn more about using our Search & Filtering tools here. Once you create a filtered view of expenses you can now Export that data to either a .CSV or .PDF file. CSV Export - This will contain all of your raw expense data (User, Merchant, Amount, Date Submitted, Date Transacted, Approval Status, etc). We expose every field that we collect that is tied to the expense. PDF Export - This document contains a coversheet of your expense data along with an appendix of all the associated receipt images. If you needed to archive your expense data or share with a third party, this is the perfect document to export. If you need to export expense data for your accounting platform, the quickest way to do that is go to your company's Bank Transfer History page to export the expense data tied to specific outgoing Bank Transfers. It's a one-click approach to getting the relevant expenses you need to book to bank transfers in your platform. Just click on the Export link that is in-line with the right transfer and pick your file type (CSV or PDF).